Care College health insurance is tailored to the needs of language students, guest students, scholarship holders, doctorate students and participants in international projects at universities and colleges. It also covers the needs of exchange students, e.g. ERASMUS, SOKRATES or DAAD, on Working Holiday, Work & Travel and Work & Study programmes, as well as other further education and study trips abroad. International health insurance can be taken out up to the insured’s 35th birthday both for foreign students with permanent residence anywhere else in the world during a temporary stay in Germany, as well as for Austrian and German nationals during a stay abroad anywhere in the world (except the NAFTA) countries. The benefits cover outpatient, inpatient and dental treatment by all licensed physicians worldwide at the normal local fees. The premium for "Care College Basic" international insurance in the first 18 months amounts to 28.00 EUR, for "Care College Comfort" 35.00 EUR and for "Care College Premium 63.00 EUR per month. You can take out an international policy directly online and, after your application has been checked and approved, will receive your insurance documents by e-mail within a few minutes. You can also use these for a visa application. In addition we will send you the full insurance documentation, including the policy, by post within two working days. In addition to international health insurance, we also recommend that you take out a "Care Protector" accident and liability policy. You can conclude this quite conveniently together with your health insurance under Online Application for a premium from 2.00 EUR per month. 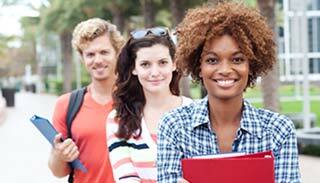 Here you can effect the Care College health insurance with online confirmation. *For a complete list of benefits see the general insurance conditions (GTI).